Ikarus is the first computer application to digitally generate fonts at arbitrary resolution. The Mergenthaler-Linotype GmbH introduces the Linocomp II photo typesetting machine and the Linotron 303/TC and Linotron 505/TC cathode ray typesetting machines. The output resolution of the 505 is either 650 or 1300 lines per inch. Type can be set from 4 to 28 points. Fun trivia: When industry veteran Frank Romano bought a Linotron 505 for his company he was shocked at the pricing of spare parts. He decided to find out what was in the machine, removed the case and discovered that most of the innards of the Linotron 505 were available at Radio Shack, the chain of electronics stores. Subsequently Romano wrote an article in TypeWorld listing those Radio Shack parts numbers. Linotype sued him for copyright infringement. They lost and Romano then countersued Linotype. He won and used the proceeds from the settlement to build an addition onto his home. It was called the ‘Linotype Wing’. 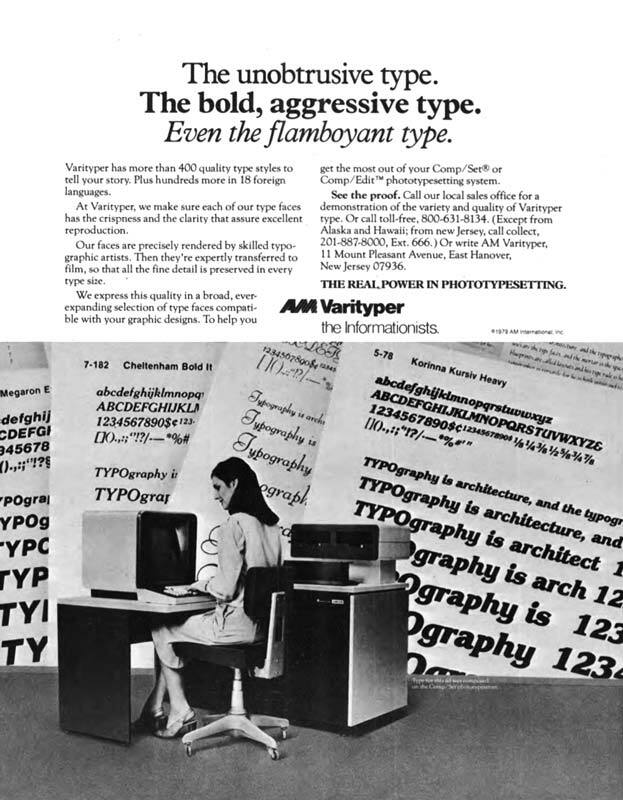 The Comp/Set is the first AM Varityper phototypesetter with an integrated monitor. Below is the advert for this machine (note the company tagline ‘the informationists’ and the fact that in those days you could still write a company to ask for more information). Compugraphic introduces the Unified Composer, a similar type of machine with integrated floppy drive and monitor. Fotoba is founded in Italy. The company manufactures cutting devices. 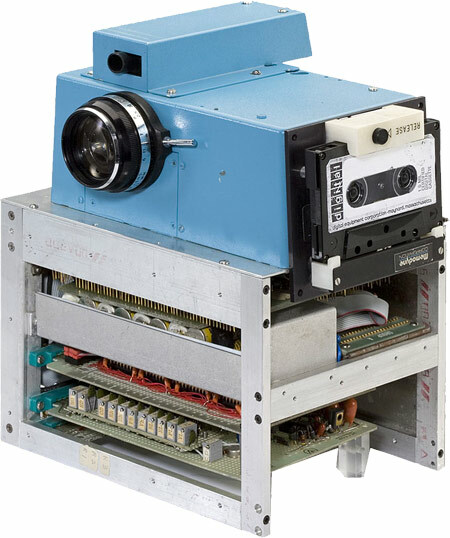 Eastman Kodak engineer Steve Sasson creates the first digital camera. ITC releases Lubalin Graph, designed by Herb Lubalin and inspired by Avant Garde. India detonates its first nuclear weapon. Swedish pop group ABBA’s wins the Eurovision Song Contest with ‘Waterloo’. The Watergate scandal forces U.S. President Richard Nixon to resign. Turkey invades Cyprus and occupies 37% of the island’s territory. Hungarian architecture professor Ernő Rubik invents the Rubik’s Cube.